Tanks for the memories… | H.A.W.K.S. I have been working on a stack of kits that were sitting on my war room floor. These included some Bandai plastic kits and some Blitzkrieg Miniatures resin kits. This is part of my campaign to be able to walk into the war room. All of these kits will find themselves in a Combat Patrol™: WWII game soon. Much of my WWII ETO gaming is early war — Finland, Poland, and France. I painted these in the early war paint scheme. I’ll add some hand painted crosses to these this evening or tomorrow evening. These late war tanks will get their crosses this evening as well. This gave me a chance to get out my new airbrush and do the camouflage. I have found the results are very dependent on the viscosity of the paint. The Vallejo Model Air paints go through the brush like a dream, but I could NOT get the cheap craft paint to flow. The Pz. IV skies are probably too fragile for gaming. We’ll see. I also plant to apply some foliage clusters to the front of the Hetzer for some visual interest. These were really fun kits to assemble. I don’t game the desert campaign. I wasn’t sure I was going to be able to use these. On a recent trip to the Bovington tank museum, I bought a little book that showed this paint scheme for the Matildas in France in 1940. I painted them in those colors for that campaign and also for some hypothetical Sea Lion games. 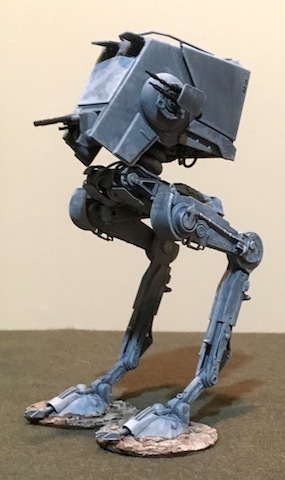 I also assembled this for the upcoming Star Wars supplement to Combat Patrol™. This was a fun kit. I may get another one. I generally like to employ vehicles in pairs.